We can blog, tweet, promo, purchase ads and wave pom poms over our book and that is all lovely. Attention is grand. An on-line platform is essential. But, if none of these efforts translate into an actual sale? A lot of time and money wasted. What is the best way to sell books? 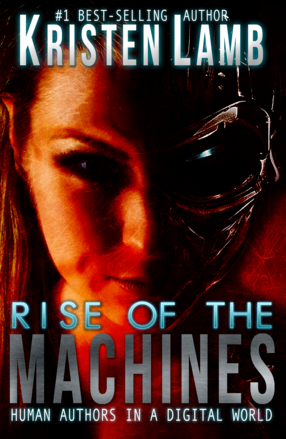 In my latest book, Rise of the Machines–Human Authors in a Digital World I actually spend a lot of time explaining why advertising and marketing doesn’t sell books in the new paradigm (or any other, for that matter) and what changes to make for any advertising or marketing to be more effective. Yet, ads, banners, book trailers aside, people want to read a great book. Our sample pages, which are the beginning of the book, are our most priceless selling tool. This is why I’ve dedicated just as many (if not more) blog posts to teaching craft than I have teaching social media. Social media is not magic and it will work far better with a great product (book). Whouda thunk? I’ve run the first-twenty-pages-contest on this blog for about four years. Most of the samples I get? I don’t need 20 pages. I need one. Maybe five. At the outset? TEN (but that’s rare). I already know all the writer’s good and bad habits as well as the writer’s level of education and skill (or lack thereof). It’s simply shocking how many of the same problems plague the beginning of most first-time novels. And it’s easy to think this is all very unfair, but think of your own experiences browsing a bookstore. Aside from cover and interesting title and story description, what do we do? We open the book and scan the first couple of pages. If those first pages stink or are lackluster, we don’t give the writer twenty of fifty or a hundred pages to sell us. Image via Flickr Creative Commons, courtesy of the U.S. Navy. Sample pages are…samples. If we go to Sam’s or Costco, how many will stop for a sample of egg rolls, pizza, or Acai juice? If the sample Green Juice Gut-Blaster tastes like steel wool mixed with moldy spinach, will you BUY the mega-bottle of Green Juice Gut-Blaster hoping it tastes better by mid-bottle? For a fantastic resource about this, I highly recommend (AGAIN) Les Edgerton’s Hooked. Also, tonight is my First Five Pages Class to help you out (deets down the page), because we all know that the TOUGHEST part of writing a book is the BEGINNING….then the middle and WHOA—crap—the end. But, this class is for the first FIVE because if we can’t nab a reader there? The rest is moot. A seasoned editor can tell a lot about your book with only five pages. Learn to hook hard and hook early. TONIGHT!!! I am running the Your First Five Pages Class. Use WANA10 for $10 off. This is the perfect class for diagnosing bigger story issues or even getting a work agent-ready in time for conference season. This class is April 25th 6:00-8:30 PM NYC Time. Gold Level is available if you want me to critique your 5 pages. Also, if you are struggling with plot or have a book that seems to be in the Never-Ending Hole of Chasing Your Tail or maybe you’d like to learn how to plot a series, I am also teaching my ever-popular Understanding the Antagonist Class on May 10th from NOON to 2:00 P.M. (A SATURDAY). This is a fabulous class for understanding all the different types of antagonists and how to use them to maintain and increase story tension. Remember, a story is only as strong as its problem 😉 . This is a GREAT class for streamlining a story and making it pitch-ready.